Reading and share top 39 famous quotes and sayings about Banners by famous authors and people. Browse top 39 famous quotes and sayings about Banners by most favorite authors. 1. "To judge from the entrance the dawn was making, it promised to be a very iffy day -- that is, blasts of angry sunlight one minute, fits of freezing rain the next, all of it seasoned with sudden gusts of wind -- one of those days when someone who is sensitive to abrupt shifts in weather and suffers them in his blood and brain is likely to change opinion and direction continuously, like those sheets of tin, cut in the shape of banners and roosters, that spin every which way on rooftops with each new puff of wind." 2. "Bass bands, flags, banners, parades, and monster demonstrations are no different in principle from ecclesiastical processions, cannonades, and fireworks to scare off demons. Only, the suggestive parade of State power engenders a collective feeling of security which, unlike religious demonstrations, give the individual no protection against his inner demonism. Hence he will cling all the more to the power of the State, i.e., to the mass, thus delivering himself up to it psychically as well as morally and putting the finishing touch to his social depotentiation. The State, like the Church, demands enthusiasm, self-sacrifice, and love, and if religion requires or presupposes the "fear of God," then the dictator State takes good care to provide the necessary terror." 3. "The shock of collision was like the smashing of boulders in the landslide at Nesson. Damen felt the familiar battering shudder, the sudden shift in scale as the panorama of the charge was abruptly replaced by the slam of muscle against metal, of horse and man impacting at speed. Nothing could be heard over the crashing, the roars of men, both sides warping and threatening to rupture, regular lines and upright banners replaced by a heaving, struggling mass. Horses slipped, then regained their footing; others fell, slashed or speared through." 4. "Red. Red, the colour of the Regency, scrawled over with the iconography of the border forts, growing, fluttering. These were the banners of Ravenel. Not only the banners, but men and riders, flowing over the hilltop like wine from an over-full cup, staining and darkening its slopes, and spreading." 5. "It is only in retrospect that the high points of our lives rise up, flaunting banners." 6. "Black for hunting through the nightFor death and mourning the color's whiteGold for a bride in her wedding gownAnd red to call the enchantment downWhite silk when our bodies burnBlue banners when the lost returnFlame for the birth of a NephilimAnd to wash away our sins.Gray for the knowledge best untoldBone for those who don't grow oldSaffron lights the victory marchGreen to mend our broken heartsSilver for the demon towersAnd bronze to summon wicked powers-Shadowhunter children's rhyme"
7. "He quirked an eyebrow briefly, slightly, in such a way that no one afterwards might be able to safely accuse him of having done it. Sei knew the look. Names are meaningless, plosives and breath, but those who liked the slope of her waist often made much of hers, which denoted purity, clarity—as though it had any more in the way of depth than others. They wondered, all of them, if she really was pure, as pure as her name announced her to be, all white banners and hymeneal grace." 8. "We, the called and faithful and chosen, we will drive away our griefs, and set up our banners of confidence in the name of God." 9. "Would to God we were all Christians who profess to be Christians, and that we lived up to what we profess. Then would the Christian shine forth "clear as the sun, fair as the moon," and what besides—why, "amazing as an army withbanners"! A consistent Church is an amazing Church—an honest, upright Church would shake the world! The tramp ofgodly men is the tramp of heroes; these are the thundering legions that sweep everything before them. The men that arewhat they profess to be, hate the semblance of a lie—whatever shape it wears—and would sooner die than do that which is dishonest, or that which would be degrading to the glory of a Heaven-born race, and to the honor of Him by whose name they have been called! O Christians! You will be the world's contempt; you will be their despising, and hissing unless you live for one objective!" 10. "Courage is not measured byMarching bands and banners in the wind.If you have not walkedThe bloody lines and seen the faces,You have no right to describe it so.We die here to keep you safe at home,And what we sufferPray you may never know." 11. "In the loudest voice I could muster, I shouted, "As of this moment, you are no longer the armies of China, Macedonia, Myanmar, Tibet or India. You are now warriors of Durga! We have already fought and overcome many fierce creatures. Now we give you the symbol of their power. "I borrowed the Scarf and touched it to my Pearl Necklace. The silken material sped down each and every soldier to cloak them in the most brilliant red, blue, green, gold and white. Even the flag bearers were not left out and now held banners depicting Durga riding her tiger into battle. "Red for the heart of a Phoenix that sees through falsehood!" I cheered and raided the trident. "Blue for the Monsters of the Deep that rip apart those who dare to cross their domain! Gold for Metal Birds that cut their enemies with razor beaks! 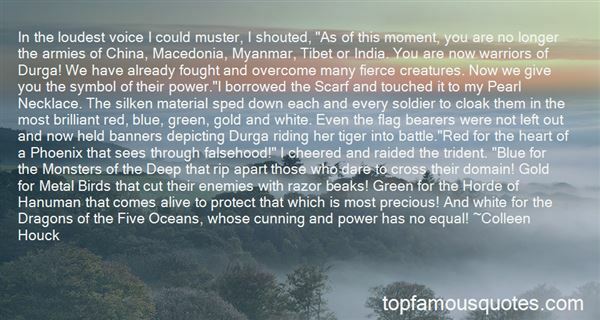 Green for the Horde of Hanuman that comes alive to protect that which is most precious! And white for the Dragons of the Five Oceans, whose cunning and power has no equal!" 12. "On march the banners of the King of Hell." 13. "The posters and rock-star buttons and banners were valueless without the perspective of the mind that had attached significance to them. Souvenirs have no worth without nostalgia, after all. They're meaningless if a memory isn't linked to them." 14. "Moving forward quietly to Jerott's side, Adam Blacklock had heard. ‘Don't you understand? The authorities are afraid of them both,' he said gently. ‘Why do you supose this cordon is here, which only an unarmed girl was allowed to pass through? Lymond, loyal to Scotland, might be a threat to French power greater than even Gabriel, one of these days—Philippa!' And a wordless shout, like a cry at a cockfight, rose among the stone pillars and sank muffled into the old, dusty banners above the choir roof. For Philippa Somerville, who believed in action when words were not enough, had leaned over and snatched the knife from Lymond's left hand." 15. "True love comes quietly, without banners or flashing lights. If you hear bells, get your ears checked." 16. "Carry out the republican principle of universal suffrage, or strike it from your banners and substitute 'Freedom and Power to one half of society, and Submission and Slavery to the other.'" 17. "A sudden gust of rain blew over them and then another - as if small liquid clouds were bouncing along the land. Lightning entered the sea far off and the air blew full of crackling thunder. The table cloths blew around the pillars. They blew and blew and blew. The flags twisted around the red chairs like live things, the banners were ragged, the corners of the table tore off through the burbling billowing ends of the cloths." 18. "May I at least carry, to the boundless possibility contained in the abyss of everything, the glory of my disillusion like that of a great dream, and the splendor of not believing like a banner of defeat; a banner in feeble hands, but still and all a banner, dragged through mud and the blood of the weak but raised high for who knows what reason - whether in defiance, or as a challenge, or in mere desperation - as we vanish into quicksand. No one knows for what reason, because no one knows anything, and the sand swallows those with banners as it swallows those without. 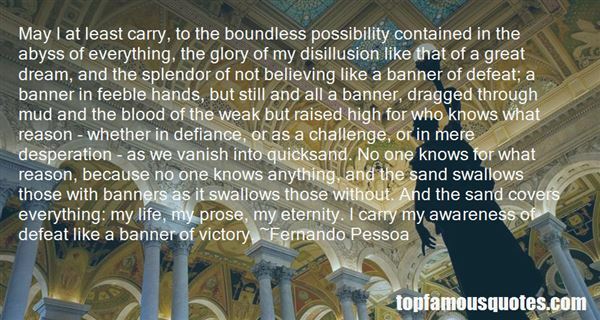 And the sand covers everything: my life, my prose, my eternity. I carry my awareness of defeat like a banner of victory." 19. "That Jones shall worship the god within him turns out ultimately to mean that Jones shall worship Jones. Let Jones worship the sun or moon, anything rather than the Inner Light; let Jones worship cats or crocodiles, if he can find any in his street, but not the god within. Christianity came into the world firstly in order to assert with violence that a man had not only to look inwards, but to look outwards, to behold with astonishment and enthusiasm a divine company and a divine captain. The only fun of being a Christian was that a man was not left alone with the Inner Light, but definitely recognized an outer light, fair as the sun, clear as the moon, terrible as an army with banners." 20. "We do wrong to seek peace in Nature; we should rather seek the nobler sort of war; and see all the trees as green banners." 21. "Children are a battle of a different sort. ... A battle without banners or warhorns but no less fierce." 22. "No singer would ever make a song about that battle. No maester would ever write down an account for one of the Reader's beloved books. No banners flew, no warhorns moaned, no great lord called his men about him to hear his final ringing words. They fought in the predawn gloom, shadow against shadow, stumbling over roots and rocks, with mud and rotting leaves beneath their feet." 23. "The maester had taught him all the banners: the mailed fist of the Glovers, silver on scarlet; Lady Mormont's black bear; the hideous flayed man that went before Roose Bolton of the Dreadfort; a bull moose for the Hornwoods; a battle-axe for the Cerwyns; three sentinel trees for the Tallharts; and the fearsome sigil of House Umber, a roaring giant in shattered chains." 24. "I heard you in the other room asking your mother, 'Mama, am I a Palestinian?' When she answered 'Yes' a heavy silence fell on the whole house. It was as if something hanging over our heads had fallen, its noise exploding, then - silence. Afterwards...I heard you crying. I could not move. There was something bigger than my awareness being born in the other room through your bewildered sobbing. It was as if a blessed scalpel was cutting up your chest and putting there the heart that belongs to you...I was unable to move to see what was happening in the other room. I knew, however, that a distant homeland was being born again: hills, olive groves, dead people, torn banners and folded ones, all cutting their way into a future of flesh and blood and being born in the heart of another child...Do you believe that man grows? No, he is born suddenly - a word, a moment, penetrates his heart to a new throb. One scene can hurl him down from the ceiling of childhood onto the ruggedness of the road." 25. "Apart from these, let all others remain to guard our glorious banners." 26. "The majority of men prefer delusion to truth. It soothes. It is easy to grasp. Above all, it fits more snugly than the truth into a universe of false appearances—of complex and irrational phenomena, defectively grasped. But though an idea that is true is thus not likely to prevail, an idea that is attacked enjoys a great advantage. The evidence behind it is now supported by sympathy, the sporting instinct, sentimentality—and sentimentality is as powerful as an army with banners. One never hears of a martyr in history whose notions are seriously disputed today. The forgotten ideas are those of the men who put them forward soberly and quietly, hoping fatuously that they would conquer by the force of their truth; these are the ideas that we now struggle to rediscover." 27. "May the United Nations ever be vigilant and potent to defeat the swallowing up of any nation, at any time, by any means-by armies with banners, by force or by fraud, by tricks or by midnight treachery." Author: Henry Cabot Lodge Jr.
28. "The orange sky is rolling across the sky like a severed head, gentle light glimmers in the ravines among the clouds, the banners of the sunset are fluttering above our heads. The stench of yesterday's blood and slaughtered horses drips into the evening chill." 29. "Or else you can say, like the camel driver who took me there: "I arrived here in my first youth, one morning, many people were hurrying along the streets toward the market, the women had fine teeth and looked you straight in the eye, three soldiers on a platform played the trumpet, and all around wheels turned and colored banners fluttered in the wind. Before then I had known only the desert and the caravan routes. In the years that followed, my eyes returned to contemplate the desert expanses and the caravan routes; but now I know this path is only one of the many that opened before me on that morning in Dorothea." 30. "Early June, Providence, Rhode Island, the sun up for almost two hours already, lighting up the pale bay and the smokestacks of the Narragansett Electric factory, rising like the sun on the Brown University seal emblazoned on all the pennants and banners draped up over campus, a sun with a sagacious face, representing knowledge. But this sun--the one over Providence--was doing the metaphorical sun one better, because the founders of the university, in their Baptist pessimism, had chosen to depict the light of knowledge enshrouded by clouds, indicating that ignorance had not yet been dispelled from the human realm, whereas the actual sun was just now fighting its way through cloud cover, sending down splintered beams of light and giving hope to the squadrons of parents, who'd been soaked and frozen all weekend, that the unseasonable weather might not ruin the day's activities." 31. "Love isn't about ridiculous little words. Love is about grand gestures. Love is about airplanes pulling banners over stadiums. Proposals on Jumbo-trons. Giant words in skywriting. Love is about going an extra mile, even if it hurts. Letting it all hung out there. Love is about finding courage inside of you that you didn't even know was there." 32. "Can't you understand? That if you take a law like evolution and you make it a crime to teach it in the public schools, tomorrow you can make it a crime to teach it in the private schools? And tomorrow you may make it a crime to read about it. And soon you may ban books and newspapers. And then you may turn Catholic against Protestant, and Protestant against Protestant, and try to foist your own religion upon the mind of man. If you can do one, you can do the other. Because fanaticism and ignorance is forever busy, and needs feeding. And soon, your Honor, with banners flying and with drums beating we'll be marching backward, BACKWARD, through the glorious ages of that Sixteenth Century when bigots burned the man who dared bring enlightenment and intelligence to the human mind-Henry Drummond, a character in Inherit The Wind"
33. "His guess was confirmed when they approached the well-built harbour of a prosperous town and saw the banners flying from the bastions of the citadel. 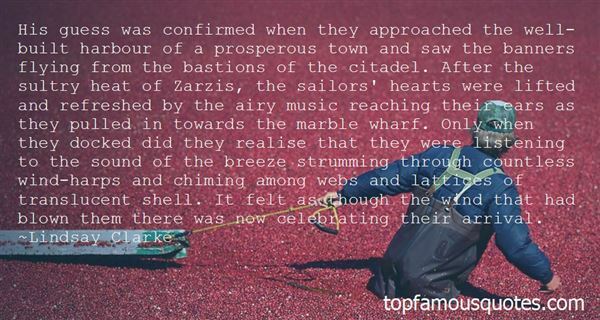 After the sultry heat of Zarzis, the sailors' hearts were lifted and refreshed by the airy music reaching their ears as they pulled in towards the marble wharf. Only when they docked did they realise that they were listening to the sound of the breeze strumming through countless wind-harps and chiming among webs and lattices of translucent shell. It felt as though the wind that had blown them there was now celebrating their arrival." 34. "Think of the glory. Think of your reputation. Think how great it'll look on your next resume. "On my cenotaph, you mean. Nobody will be able to collect enough of my scattered atoms to bury. You going to cover my funeral expenses, son?"Splendidly. Banners, dancing girls, and enough beer to float your coffin to Valhalla. "- Miles coaxing Ky Tung to agree to an almost suicidal mission"
35. "I accepted an invitation to talk to the women's branch of the Ku Klux Klan...I saw through the door dim figures parading with banners and illuminated crosses...I was escorted to the platform, was introduced, and began to speak...In the end, through simple illustrations I believed I had accomplished my purpose. A dozen invitations to speak to similar groups were proffered." 36. "The wind was against them now, and Piglet's ears streamed behind him like banners as he fought his way along, and it seemed hours before he got them into the shelter of the Hundred Acre Wood and they stood up straight again, to listen, a little nervously, to the roaring of the gale among the treetops. 'Supposing a tree fell down, Pooh, when we were underneath it? ''Supposing it didn't,' said Pooh after careful thought." 37. "Well, nowIf little by little you stop loving meI shall stop loving youLittle by littleIf suddenly you forget meDo not look for meFor I shall already have forgotten youIf you think it long and mad the wind of banners that passes through my lifeAnd you decide to leave me at the shore of the heart where I have rootsRememberThat on that day, at that hour, I shall lift my armsAnd my roots will set off to seek another land"
38. "This was the moment he most loved about tourneying, that first glorious sortie with banners streaming, trumpets blaring, and the earth atremble with pounding hooves as hundreds of knights came together in a spectacular clash of sound and fury." 39. "Hope and Memory have one daughter and her name is Art, and she has built her dwelling far from the desperate field where men hang out their garments upon forked boughs to be banners of battle. O beloved daughter of Hope and Memory, be with me for a while." She didn't know how to love, to give herself to someone, to out herself in someone else's keeping and take him into hers. She didn't trust anyone with her heart - or the darker places of her soul."